A lawyer for Saddam said the news was a "miracle"
The head of the tribunal trying Saddam Hussein, Salem Chalabi, has told the BBC that charges that he was involved in a murder were ridiculous. Speaking in London, Mr Chalabi said he feared for his life, was the victim of a smear campaign and a house he used in Baghdad had been shelled recently. He said he wanted assurances about his safety before returning to Iraq. A judge also issued a warrant for Mr Chalabi's uncle, politician Ahmed Chalabi, who equally denies any guilt. Ahmed Chalabi is currently in Iran. "My life is daily threatened because of what I'm doing... there is some element of a smear campaign against me and therefore against the tribunal," Salem Chalabi told BBC Radio 4's Today programme. He said he was in talks with both President Ghazi Yawer and Prime Minister Iyad Allawi of Iraq to negotiate his return. The US-appointed Iraqi judge who issued the warrant, Zuhair al-Maliki, said on Monday the Chalabis would be arrested "the moment they return to Iraq". The UK Foreign Office has said Salem Chalabi will not be extradited, although it is not clear whether such a request has been made. Salem Chalabi, 41, described the murder charge as "ridiculous" and "crazy". "The charge supposedly is that I made a threat to this ministry of finance official... and then he was killed," he said. "I have no recollection of ever meeting this person." He added that he feared he would be put in jail in Iraq, where his life would be under threat from Saddam Hussein supporters. 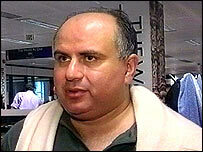 Ahmed Chalabi, 59, told Reuters news agency from Iran that he would return to Iraq to prove his innocence. He said the counterfeit charge related to forged dinar banknotes that his office, the Finance Committee, had collected as part of its work and which were seized during a police raid in May. Analysts say the warrant against the older Chalabi marks a further fall from grace since he was championed in exile by the US during the Saddam Hussein era. Salem Chalabi said he feared the warrant would impede the work of the special tribunal's staff. "Under these kinds of allegations, it makes it much more difficult," he told the BBC. His uncle said Judge Maliki had "consistently attempted to manipulate the justice system for political purposes". The judge himself told the BBC that the warrants were not politically motivated but an "ordinary Iraqi judicial case". 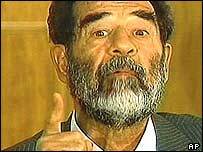 Ziad al-Khasawneh, a defence lawyer for Saddam Hussein, welcomed news of the charges as a "miracle from God" to help his client. "I want to go and face the charges because I think they are ridiculous"
"Ahmed Chalabi provided much of the intelligence on which Washington based its case for war"